Before moving to Portage, I did a quick search (Google is your friend!) for gliding clubs in the area. Looking for flying and gliding clubs before I move has been my S.O.P. for years. But this is the first time I’ve been lucky enough to have access to both a gliding club and the money to participate. Not that gliding is expensive. In comparison to powered flying, it’s insanely cheap (no fuel, no engine maintenance, much cheaper insurance, plus most gliding clubs are not-for-profit). But the only other time I’ve had access to gliding was in Nova Scotia. The former Bluenose Gliding Club, now known as Soaring Nova Scotia, is there. But at the time I had a relatively low income and I was up to my eyeballs (or as I liked to say, "up to my ankles, head first") in student loans. I have had the good fortune of several gliding familiarization flights back in my Air Cadet days. But these flights were generally very short and never left the circuit. I never did the gliding scholarship, and went straight to powered flying. So my previous gliding experience is pretty limited. So the other day I went gliding at the Winnipeg Gliding Club in Starbuck, MB. I’m not a coffee afficionado, so instead of Starbucks, the town name always makes me think of Battlestar Galactica (for non-fans, Starbuck is the callsign of one of the pilots and main characters in the show). I haven’t been here a week, and I don’t even have a house to live in yet, but I got my gliding fix. That should be some indication of how much I wanted to go:). I finally had a chance to relax and get a feel for the view. My flights in the Grob so far have had me working too hard to appreciate the view! Wow. Manitoba is really flat:). Of course, I’ve always known that in an academic sort of way. But looking out through a bubble canopy to see horizon to horizon from 4,000 feet really drives the point home! I don’t know how long we were up—I was just a passenger, so wasn’t too concerned about timekeeping—but it must have been in the 40-60 minute range. We unhooked from the towplane at 3,200 feet and gradually thermalled our way up to 4,500 feet. At times, we were circling in thermals with 2 other gliders. It was phenomenal. The ability to thermal in a powered aircraft is rare. I’ve never seen it first hand, but I’ve heard of it being done in exceptional circumstances (lightly loaded aircraft with good glide characteristics in a very strong updraft). So watching the altimeter increase without any engine noise was a new experience for me. Alas! My camera is still back on the Rock, so I don’t have any pics to share:(. 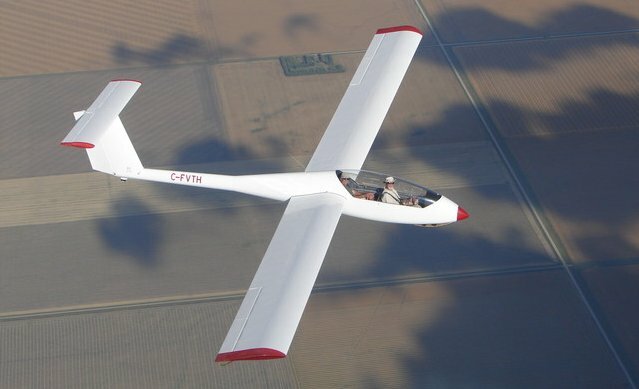 The posted pic is from the gliding club’s website. The gliding season is almost over, and I’ll be pretty busy for the next few months with moving, settling in, and getting my QFI training done (not to mention my IFR renewal). So regular gliding excursions will have to wait until next year, when I plan to finally get my license. Nonetheless, I do hope to get up once more before the season is done.